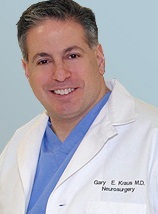 Dr. Kraus' research is published in books and leading peer-reviewed journals. Further, he presents his papers at society meetings. In addition to his research contributions, Dr. Gary Kraus is an inventor and has patents pending related to spinal instrumentation and devices for improving minimally invasive spine surgery.